You have entered the website of the International Ship Recycling Association (ISRA); a platform for recyclers who have developed a quality standard based on requirements needed to protect the environment and to secure works safety during the recycling process. On the website you will find the names of recycling facilities in your region, information about the goals of ISRA, latest news, how to become a member and other information you are looking for. Apart from the recyclers other companies have joined ISRA as associated member which can offer ship recycling related services. We hope the site answers your questions but please do not hesitate to contact the secretariat for anything you like to know about us. 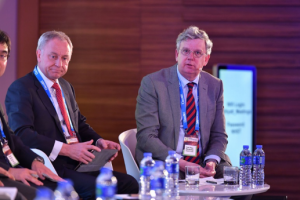 News item no 8, March 2019 TradeWinds event Hong Kong On the 5thand 6thof March 2019, TradeWinds organized the Ship Recycling Forum in Hong Kong. Instead of numerous presentations, this conference gave much attention to panel discussions. Compared with conferences in the past, this meeting was noticeably less outspoken and the traditional separation between the representatives of the Indian subcontinent and responsible ship recyclers was absent. The application for the EU-list might be causing this effect. Peter Koller from the European Commission stated that there were 25 applications pending; 6 from Turkey, 14 from India, 4 from China and 1 from the USA. He indicated that Turkey and India will very soon make additional applications. Peter Koller EC A very interesting contribution was made by Chris Calvert. He showed the pathway of the recycling of (warship) HMNZS Endeavour under the Basel Convention. This warship was recycled at an Indian yard. During lunch break Director ISRA was approached by parties who had accompanied this unusual practice. They argued that from the side of ISRA not one recycling yard had reacted on the tender. ISRA will contact Mr. Calvert to see what has happened. (Do not hesitate to email to me if you have information on this subject: Reinoud.pijpers@isranetwork.com). Dimitri Ayvatoglu Dimitri Ayvatoglu from Leyal Recycling facilities in Turkey proudly announced that his yard was the first to recycle a vessel under the new EU legislation. He further showed some developments in the recent past: Norwegian pension funds drop investments due to poor recycling practices, an increasing number of banks starting to embrace RSRS and the convictions based on penal law in the Netherlands. Tom Peter Blankestijn (R) as moderator Tom Peter Blankestijn (Sea2Cradle) pointed out the situation in China. Though the ban on end of life ships not flying the Chinese flag remained, China should consider the fact that a great number of ships are being produced in China. That should have implications for the responsibility of the Chinese government. The developments in China will be closely followed by ISRA. News item no 7, March 2019 ECSA published strategy document for 2019-2024 The ECSA published the “Strategic priorities for EU-shipping policy 2019-2024” In this document ECSA refers to a changing world driven by challenges such as climate change, social questions, barriers to free trade and security concerns. ECSA elaborates in this document on the need for free and open international shipping markets, maintaining competitiveness through existing guidelines on state aid, calling for global rules to avoid reducing competiveness, innovation and digitalization, the completion of the internal market for (shortsea) shipping and building and maintaining the successes of the Shipping Social Sector Dialogue. ISRA regrets that the ECSA does not address sound and safe ship recycling as one of the key elements in the sustainable shipping industry. No reference whatsoever is made in this field. 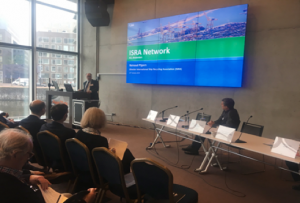 ISRA is of the opinion that sound and safe recycling should be an integral part of the sustainability policies of ECSA and the individual ship-owners. News item no. 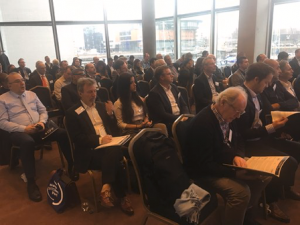 6 February 2019 ACI congress ACI conference on Ship Recycling 30– 31 January 2019, Amsterdam ISRA was well represented at this conference in Amsterdam. Tom Peter Blankestijn (Sea2Cradle, associated ISRA member) held a very clear and instructive presentation regarding the similarities and differences between HKC and the EU SRR: HKC aiming at the structure, EU-SRR not only the structure but also the operation. He elaborated further more the process of getting EU verified and listed. Tom Peter got further into detail concerning the relationship with China since their ban on imports of end of life ships. He showed the new political reality of the just renamed ministry of Ecology and Environment. Tom Peter mentioned that there are signals indicating a possible rethinking of this matter in China. Peter Wyntin (Galloo Ghent) answered the question of an alleged shortage of capacity. Based on IHS-figures he easily could demonstrate that in the past the amount of surplus recycling capacity was enormous, considering the little amount of supply of end of life ships. Peter also stressed that the EU and NGO came with the same figures. Peter underlined the fact, that also with the new EU-regulation, capacity is no problem. He mentioned furthermore that health, safety and environmental standards must not be seen as fixed, but could and should be subject of new legislation. He gave as example the lost time injury frequency rate considering accidents at work, carbon footprint reducing oil and fuels and maximization of using renewable industry. Of course, Peter mentioned the necessity of enforcement of the rules, by national governments and the EC. ISRA members invest heavily in safe and sound recycling. By enforcement of the regulations the authorities have to play their active role. Dimitri Ayvatoglu (Leyal Ship Recycling group Turkey) had a presentation on changing the mode of contracts. In his presentation, he pointed out the various relationships with templates of contracts and “layers” to complete the contract commercially. Reinoud Pijpers (director ISRA) introduced himself as the new director of ISRA. In his presentation, he treated the role of ISRA in the past, the present and the future. ISRA started mainly as a policy formulating organization, delivering bricks for the HKC and the EU-SRR. Nowadays emphasis is put on the enforcement. Reinoud mentioned the actions of ISRA which were and are taken in this field. He also referred to the excellent contacts with the EC. 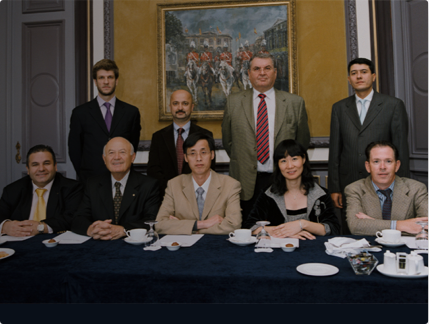 Through these contacts ISRA can carry out influence, for instance in the China case. 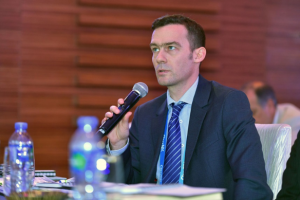 Reinoud called up to become an ISRA (associate) member illustrating that this membership is a clear signal that the company concerned is taken sound and save ship recycling seriously. News item no. 5, February 2019 The Netherlands ratifies Hong Kong Convention The ratification of the Netherlands by the Hong Kong Convention is scheduled next Wednesday, 20 February 2019. Then, on behalf of the Kingdom of the Netherlands, the Netherlands will hand over the official deed of acceptance of the Hong Kong Convention to the Secretary-General of the IMO.The Netherlands is then the 8th* country that ratifies the Hong Kong Convention. *Countries that have ratified the HKC: Belgium, Congo, Denmark, France, Norway, Turkey and Panama. News item no. 4, February 2019 Director ISRA visits Turkish yards A vessel landing Reinoud Pijpers visited (the first week of February 2019) the yards of a number of (new) ISRA members. Reinoud had the excellent opportunity not only to visit the various yards but also to have an exchange of views with several yard owners. The yards concerned: Avsar, Isiksan, Leyal, Leyal Demtas, Simsekler, SOK and Temurtaslar are all on the same spot. The method of recycling is landing. After the main parts of the ship are removed, the ship is pulled ashore for further demolition. Of course, the ships are in that phase demolished at a concrete floor and a drainage system prevents (oil) spills running into water. The downstream waste is carried out jointly, by all the yards concerned. The Ship Recycling Association Turkey, SRAT, situated close to the premises of the yards plays an active role in the waste management of the downstream of waste. ISRA had also the possibility to exchange views with the SRAT. Membership of ISRA is highly appreciated by the newly appointed chairman of the SRAT. During my visit the good news was received that Turkey had ratified the Hong Kong Convention (HKC). Though the government had one condition: a ship recycling plan should be presented for approval to the Turkeys authority. With this condition, the Turkeys authorities will stay to play an important role on the enforcement of the HKC. It was not clear whether this role will also be applicable for the EU-listed yards. During the various talks it was clear that being on the EU-list is very important. Membership of ISRA lies in the same line. The Turkish yards concerned see ISRA as an organization that represents the (Turkish)-ship recycling yards very well on a global scale. News item 3, February 2019 Secretary General ISRA, Bernard Veldhoven, was invited by the European Commission (EC) on 1 February to attend an expert meeting with the EC and the member states. ECSA and NGO-platform were also invited. One of the reasons for the EC to organize this meeting was to facilitate member states to a direct exchange of views concerning the entry of force of the new EU Ship Recycling Regulation. One of the main issues related to his new regulation, is the capacity needed and the capacity available. ECSA published figures concerning this field. 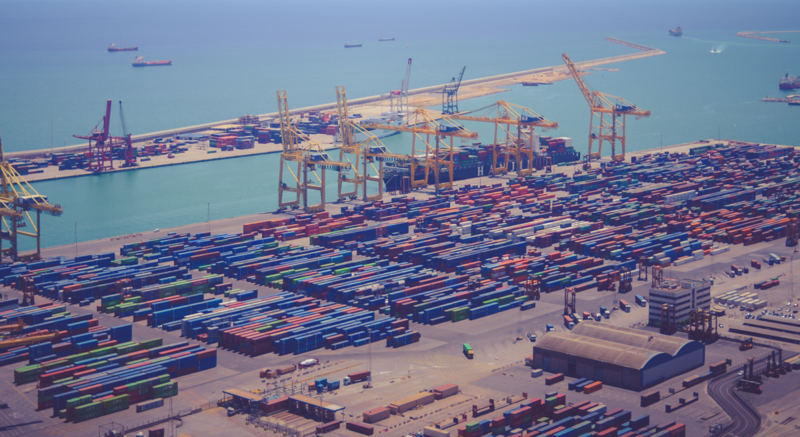 The EC, NGO and ISRA thoroughly scrutinized the capacity issue and shared the conclusion that the needed capacity for ship recycling at EU-(listed) yards was more than sufficient. 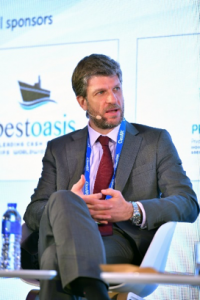 ISRA emphasized during the meeting that the EU ship recycling yards are keen to receive (EU-flagged) ships in order to fill the under capacity. ISRA also pointed out that requests for quotations are up till now minimal and sometimes fake which makes it difficult for the EU-yards to treat them seriously. ISRA made its position very clear to the member states that only high standard yards should be listed as its members are. ECSA repeatedly maintained that HKC is the only (global) solution, implicitly stating that without this global instrument, ship owners are confronted with a non-level playing field forcing them to choose for the beaches. Some member states were very surprised ECSA did not openly support during the meeting the efforts done by the EC and the MS. ECSA also had difficulty denying that India, as soon as the HKC gets into force, will make all Indian yards “HKC-compliant” in order to protect its own substandard industry. 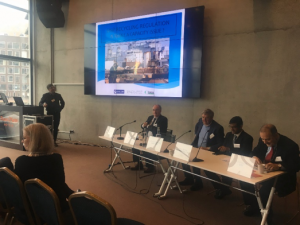 NGO shipbreaking made it very clear that the supposed positive effects of the ship recycling industry for Bangladesh are very disputable since only 18000 workers on a total population of 140 million people might have any advantage, if any, given the regular and on-going casualties. Furthermore, only a small part of steel is used, since the quality is so bad that it is not fit to be used for important structures. News item No. 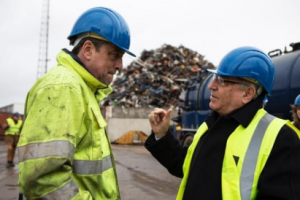 2 January 2019 Visit European Commissioner Vella, Galloo Ghent On January the 8th, an EU delegation led by EU Commissioner Karmenu Vella, responsible for Environment, Maritime Affairs and Fisheries, visited the Galloo yard in Ghent. Mr Vella was guided through the yard by Director of the yard Peter Wyntin. Peter Wyntin showed him the various measures that have been taken to enable sound and safe recycling. He explained him that only through huge and costly investments these facilities can operate in a responsible way. He referred to the illegal exports of end of life ships from the EU(flag) and stated that those exports harm the competition position of responsible yards severely. After the visit, Mr. Vella was informed about the figures of the Galloo yard. Secretary General lSRA Bernard Veldhoven and Director Reinoud Pijpers used this opportunity to thank him personally for the progress made on the EU- list. They emphasized that the EU Regulation and its Technical Requirements are good instruments for the accession on the list. They underlined a correct application of the requirements. Mr Vella stressed the need for ISRA to expand their members, so that ISRA represents a broad basis for sound and safe ship recycling. In his press statement afterwards, Mr Vella was very clear: “For too long, EU vessels have been dismantled in poor environmental and social conditions. This is not acceptable any longer. The full entry into force of the EU Regulation on ship recycling is a milestone for this sector, as it provides for the first time clear and specific rules on how EU-flagged vessels should be recycled. Like other recycling activities, ship recycling can be carried out sustainably, in a way which is good for workers, the environment and the economy. This is what is happening at the Ghent ship recycling yard and this is what the EU aims at. We count on all actors in the sector to work constructively with us to make it happen”. there because of the high steel price and low labor costs. The Public Prosecutor calls the working conditions "harrowing" and says that there is "environmental damage to the environment and serious danger to the health of workers and the local population". It is estimated that thousands of workers become incurably ill due to unprotected contact with toxic substances. In March last year, a shipping company and its board members were convicted in the Netherlands for the illegal demolition of ships. Shipping company Seatrade Holding, five subsidiaries of the company and a director and board member of one of the subsidiaries were then convicted. They received fines and a professional ban. available capacity regarding the new EU-shiprecycling regulation. 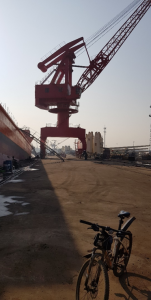 From 14-18th of December 2018 the director of ISRA visited the ship recycling facility Jiangyin Xiagang Changjiang Ship recycling in China. This facility is situated at the Yangtze river in China, and is capable of receiving very large vessels. The recycling process takes place alongside and drydock, for the last part of the vessel. The facilities contain every aspect of sound and safe ship recycling amongst: asbestos storage without possibilities of containment, for a large part of the yard concrete floors, prevention of oil spill facilities and an accurate separation of various (non ferro) metals and waste. Through the large area of the yard separated by well indicated ways, safety enhancement concerning traffic flows can be relatively easily achieved. ISRA also had the opportunity to meet its associate member Sea2cradle. This company is carrying out oversight for the shipowner on a daily basis and checks on safe and sound working on the yard through the permanent presence of surveillance officers during the recycling activities. The Director of ISRA spoke with the owner of the yard, Mr Li Hongwei. He welcomed every support from ISRA and other bodies to the Chinese government to reconsider the ban on waste including end of life ships from the EU. Since this yard and the facilities in Zhoushan, also owned by Li Hongwei were applicants for the EU-list, Mr Li Hongwei emphasized the need to inform the competent authorities in China, to reconsider this decision.